I’m so excited for my brother Thomas and his wife Lisa, who will be expecting their first baby this July. They’ve chosen to not find out about the baby’s gender until birth, leaving me (happily), with the wide open theme of blue and pink for Lisa’s baby shower last week. 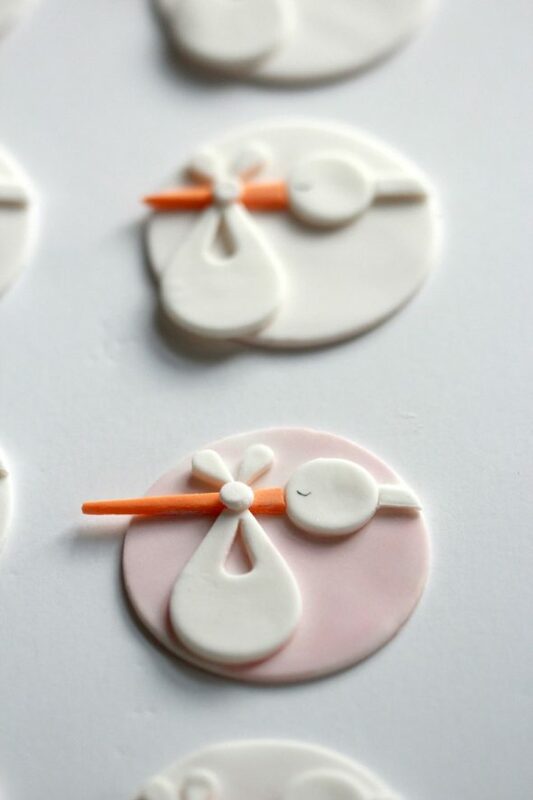 I chose to make these sweet and easy stork cupcake toppers, in blue and pink of course, and have shared a little how-to for you below. 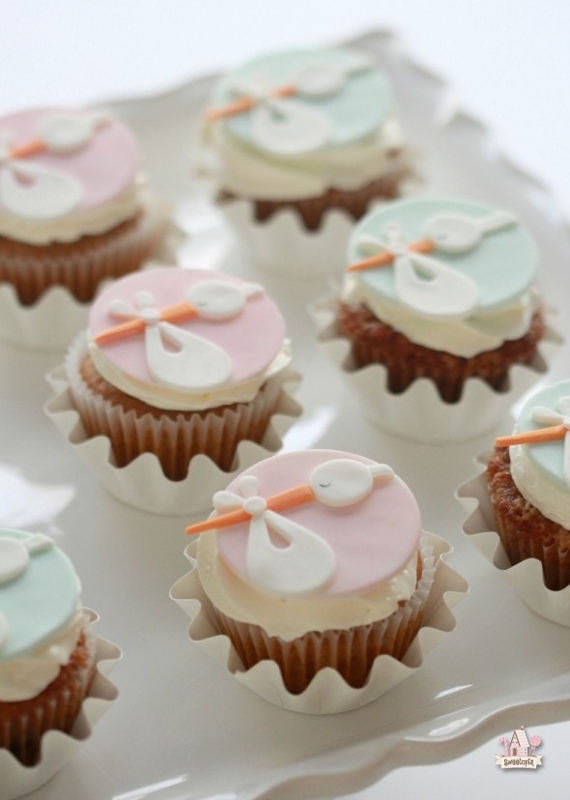 The toppers are copies of Edible Details’ beautiful stork cupcake here. (Thank you Brittany! Hers is much prettier by the way). Brittany sells her cupcake toppers so if you’d rather order than make them, you can find her web page here. The toppers are made out of fondant. 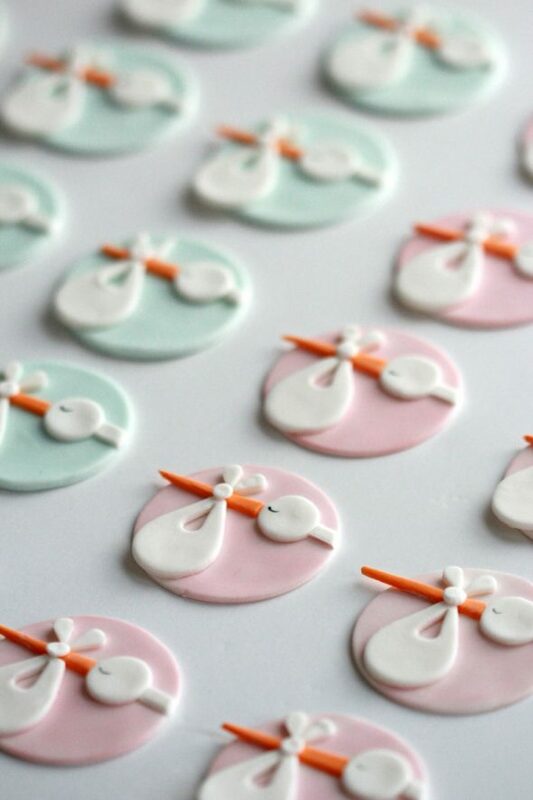 You can either make your own fondant (recipe here), or buy it ready-made. My favorite brand taste wise is Satin Ice, which you can find here . 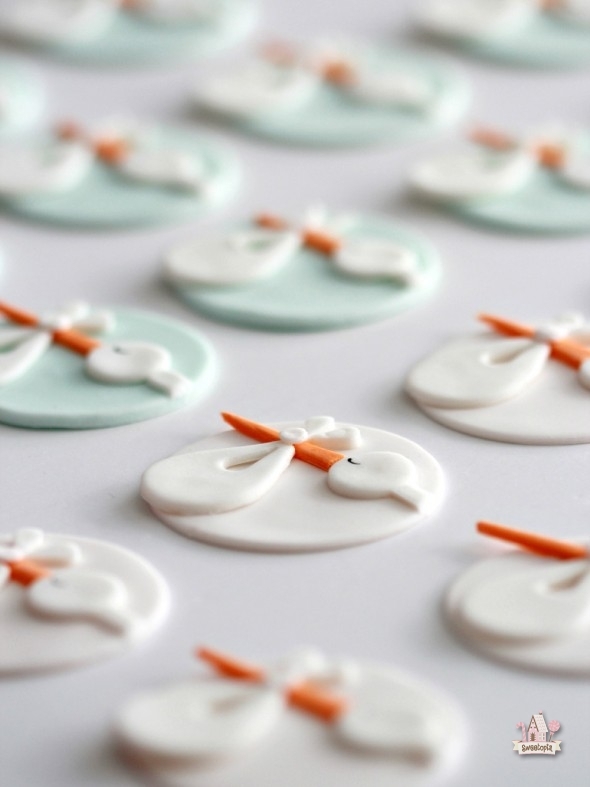 How much fondant you’ll need will depend on how many toppers you’re making. A 1kg container of Satin Ice was enough to make 25 toppers with leftover fondant. 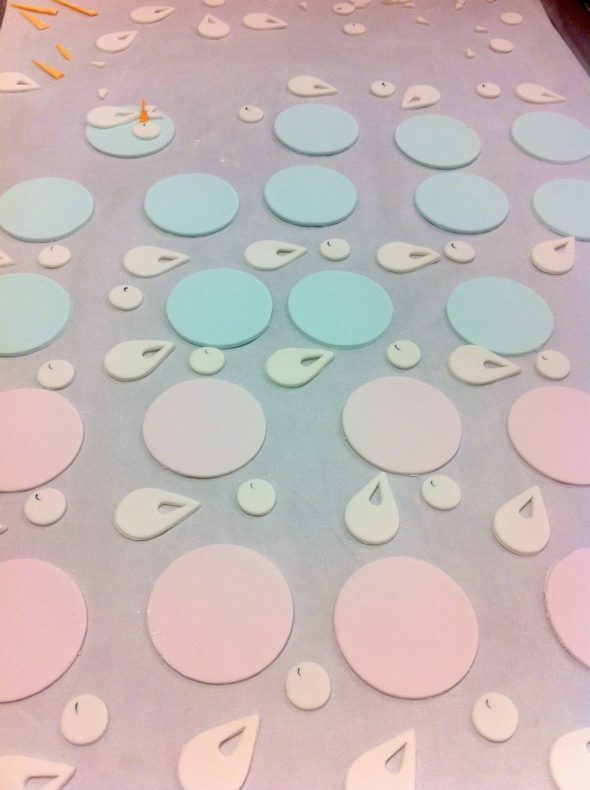 I used soft pink, sky blue and orange food gel colorings to tint the fondant. In hindsight, I would have tinted the pink a little darker, as over a period of a few days, it dried to an almost white color. Interesting to note is that they weren’t even exposed to sunlight. Below is a photo of the original pink color (excuse the bad quality phone pic please), and above what it ended up like when dry. It was an easy fix though – I used light pink lustre dust and a fluffy brush to dust on the pink coloring. You can find a basic video on how to roll and cut out fondant here. 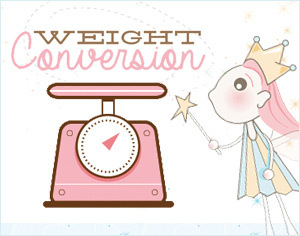 Note: You can easily change the size of the toppers according to your needs, the tools above can be used as a guideline, as most of the tools come in sets of different sizes. Once all the pieces have been cut out, let them dry overnight on a flat surface lined with parchment paper. If you live in a humid environment you may need to wait several days to let them dry. Paint the eye on the stork using a fine paint brush and a small amount of black food gel coloring mixed with a tiny amount of water. Essentially like a watercolor consistency. 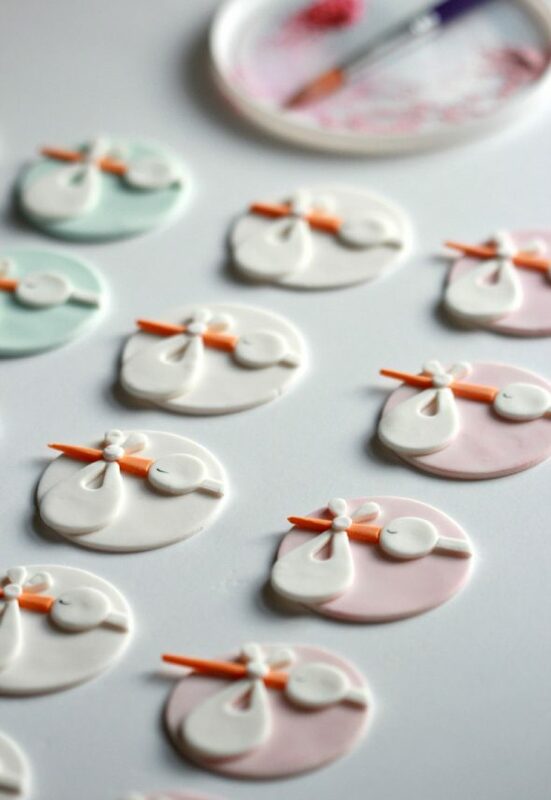 Adhere the stork and bag fondant pieces to the base with royal icing. The toppers can be made ahead; I made these 4 days in advance of the shower, but have made fondant toppers up to a month ahead. Make sure to store in a cardboard container, layered between parchment paper and cardboard dividers. Make sure you dry and store the toppers in a cool, dry place. 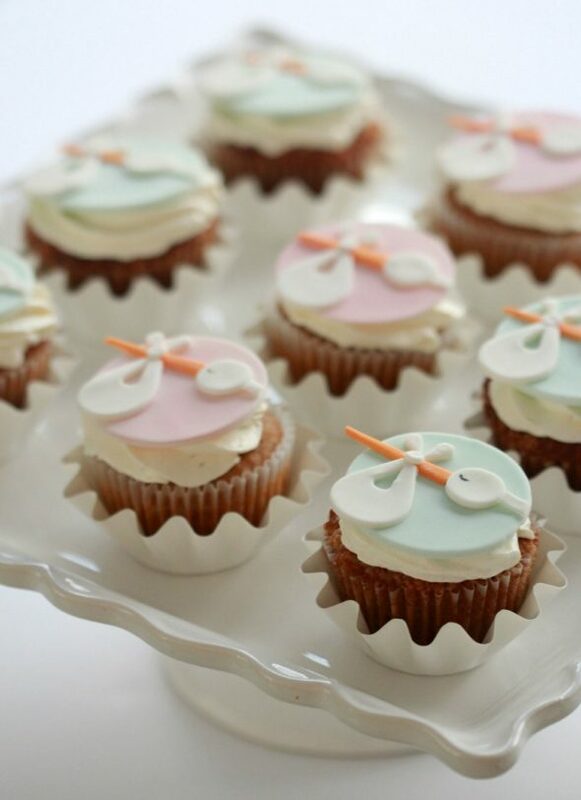 Place the toppers on the cupcakes at the last possible minute, especially in a humid environment. 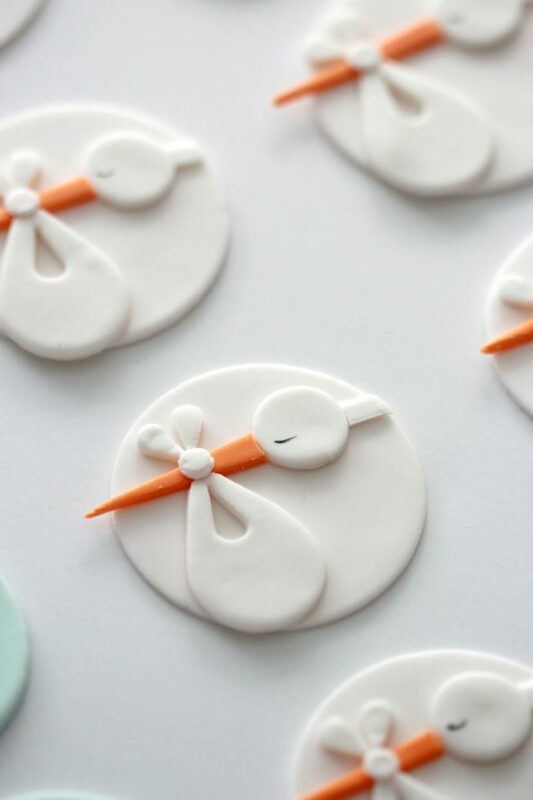 The fondant will slowly absorb the moisture of the icing and soften over time. The floret cupcake liner is from Bake It Pretty. 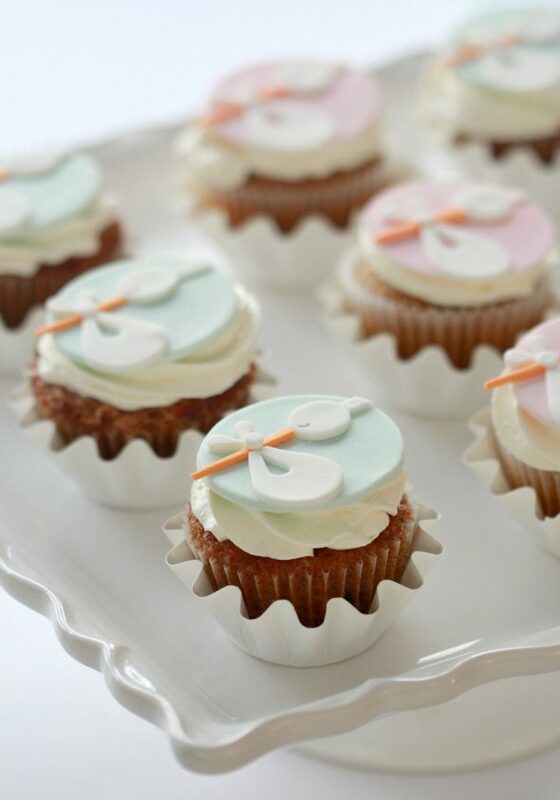 The cupcakes with blue toppers are carrot cake cupcakes with cream cheese icing and the cupcakes with pink toppers are pumpkin with cream cheese icing. A 1M piping tip was used to pipe the cream cheese icing. A little secret… I slightly whiten my cream cheese icing with white gel coloring . Thanks so much! 🙂 Yes, I got them from Bake it Pretty. You can find the link near the bottom of the post in the notes section. 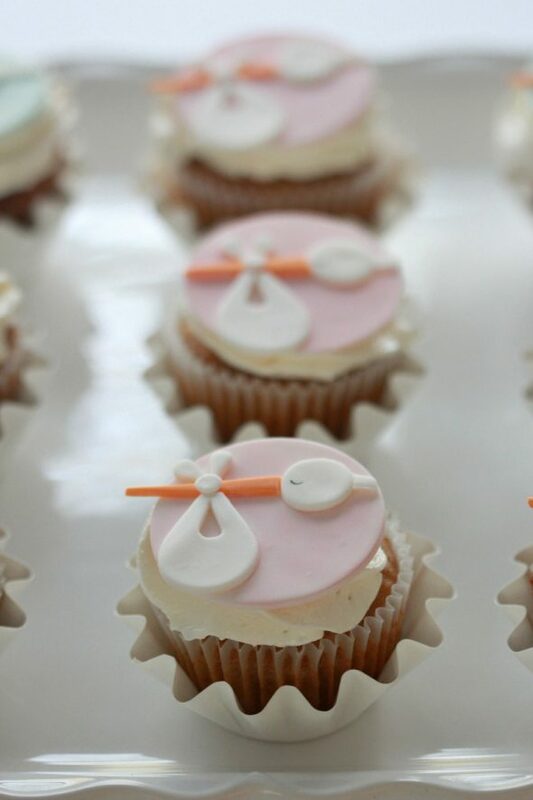 These are so sweet Marian!! And as usual your photos are so beautiful! 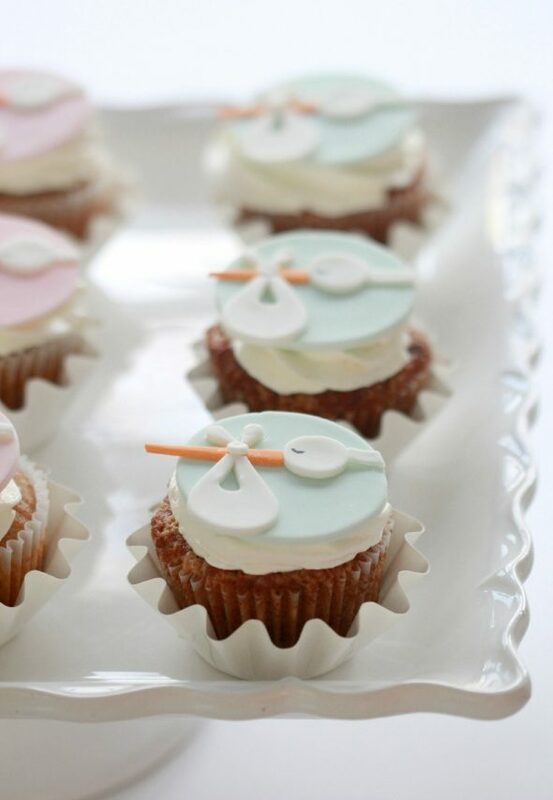 I love your creative baby cupcakes. I’m sure they were a hit at the shower. Lots of great details. Thank you for sharing all your talents. Such cuuute storks, ohmy. 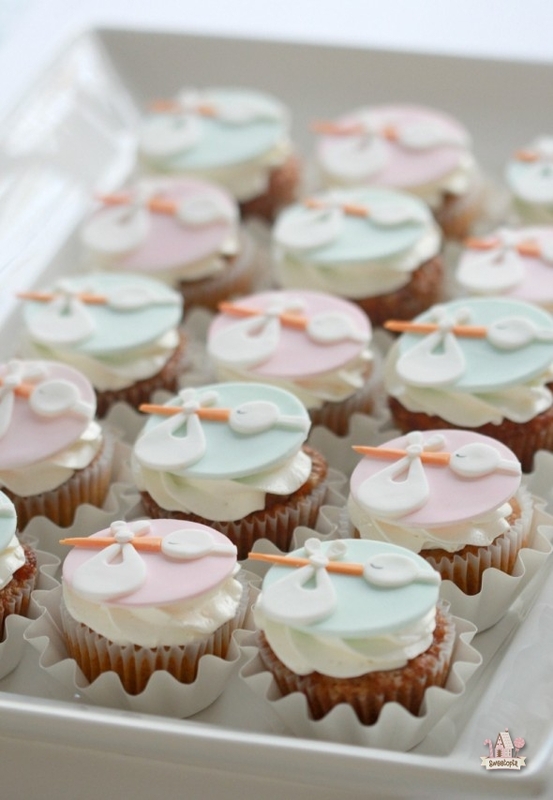 I bet Lisa’s baby shower was a hit and people loved these adorable cuppies. Such happy news! These toppers really make me smile.